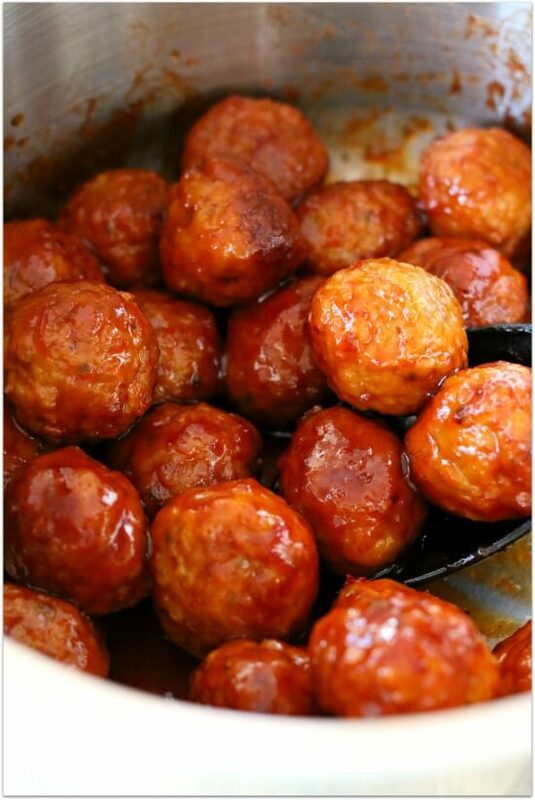 Slow Cooker 3-Ingredient Party Meatballs–These meatballs are a perfect appetizer. 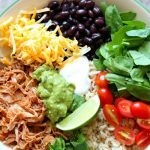 With only 3 ingredients and the use of your crockpot they literally take 3 minutes to prepare. They are super flavorful with a little bit of savory and a little bit of sweetness. 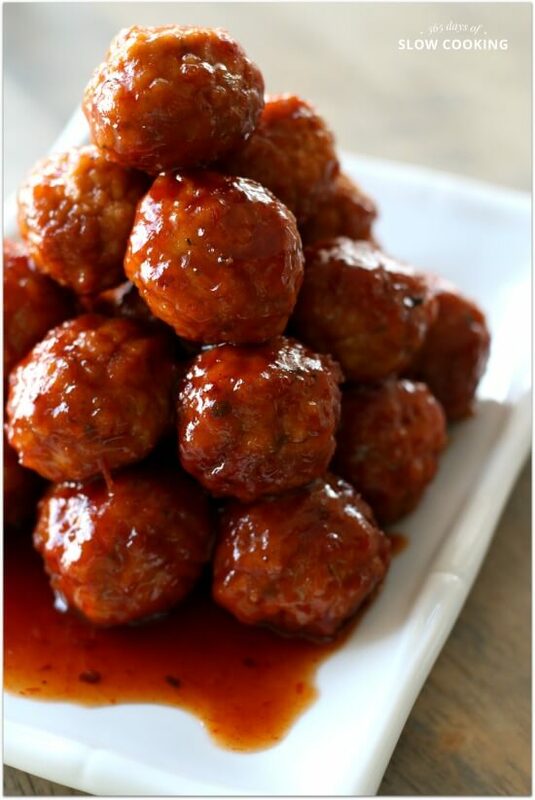 Whether you’re hosting a football watching party or attending one you need to make these meatballs! I promise they will get eaten up in 2 seconds flat. Everyone will be asking you for the recipe. 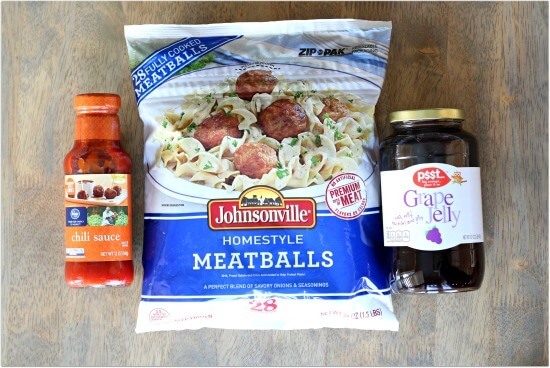 It may get a little bit embarrassing when you tell them that they just have three ingredients–frozen meatballs, grape jelly (I know), and chili sauce. That’s it! Really. It sounds weird but they are so good. For this recipe I’ve teamed up with Johnsonville Sausage. I know you’ve heard of Johnsonville before and have probably noticed their products in the sausage aisle. But did you know they are also in the frozen foods section? I picked up these Johnsonville meatballs in the frozen foods with the frozen meatballs. Can I just tell you how much I love sausage? The reason? 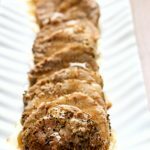 It’s so well flavored that you don’t really need to add any other seasonings and therefore you can make recipes with only a few ingredients and no hassle. I suggest having a “sausage bowl” party this year! For example, I like to use sausage in Velveeta Rotel dip. It just brings it to a whole new level. Start this recipe with your slow cooker and a bag of Johnsonville’s Homestyle Meatballs. If you’re making for a large group of people, I recommend doubling the recipe. You’ll still be able to fit everything into a 6 quart slow cooker with no problems. You’ll stir the grape jelly and chili sauce together and coat the meatballs with it. Then you’ll simply cover the slow cooker and turn it on low for 4 hours or on high for 2 hours. The meatballs are already cooked through so they basically just need to be warmed. When the meatballs are heated up you can just switch the slow cooker to warm and serve the meatballs straight out of the crock. This will keep them warm while serving. Host your own Sausage Bowl Party this year! To save time I always use my slow cookers when hosting a party (I like this one for parties). I make everything a few hours ahead of time and then I’ll have time to get dressed and put on makeup. I’ll also have time to clean up a bit before everyone arrives. Make 3 warm dishes. I suggest these meatballs, the Velveeta Rotel Sausage dip and Chiliville Chili. Then you can ask your guests to each bring a dish that doesn’t need heat. Let people bring what they want to bring. You can even ask them to bring their favorite recipe. I really, really don’t like it when I’m “assigned” something to bring. It makes me stressed out when it’s not my specialty. If you ask your guests to bring their favorite dish then you’ll be sure to have lots of good food! For decor one idea that I thought was super cute is to use cut out circles of astroturf as coasters. How cute would that be? You can buy it at the hardware store for $1 per square foot. The other thing that I like to do is head over to my local party store. They always carry cute team decor and napkins and plates and such. If you are crafty and up to the challenge there are always lots of cute printables on pinterest (in case you wondered, I’m not crafty…I’m pretty much all about the food). These meatballs are a perfect appetizer. 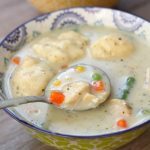 With only 3 ingredients and the use of your crockpot they literally take 3 minutes to prepare. They are super flavorful with a little bit of savory and a little bit of sweetness. Combine grape jelly and chili sauce in the bottom of the slow cooker. Whisk until somewhat smooth. Pour in the frozen meatballs. 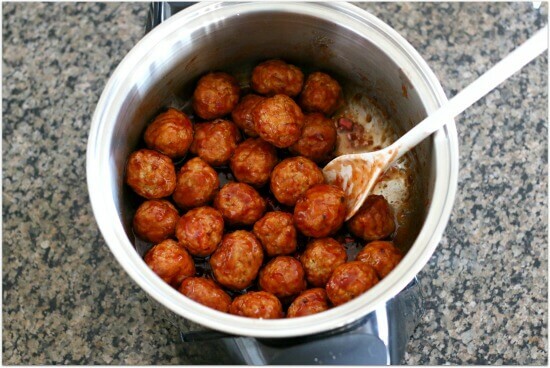 Use a spoon to coat the meatballs in the sauce. Cover the slow cooker and cook on HIGH for 2 hours or on LOW for 4 hours. When meatballs are heated through, turn the slow cooker to warm. Serve and enjoy! To see all of my sausage recipes go to my visual index here. Oh My! Oh My, Karen; was this recipe ever hot with the chili sauce!!!! 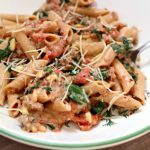 My son Ryan loves hot stuff; and this recipe made it’s match he couldn’t eat it as it was FAR TOO HOT FOR EVERYONE TO EAT! My mouth is still burning! I bought a mild Chili Sauce and it was far too hot. I tried to add a 1/8 cup of brown sugar as well as some water to the sauce before I served it and it was still far too hot! Any suggestions what I could do for next time? I’m wondering what type of chili sauce that you got? The kind that I use is next to the ketchup and it’s just slightly more spicy than ketchup. Did you use a chili paste or something??? 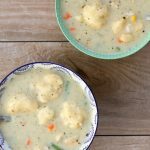 If I wanted to cook this in my instant pot. What timing would you suggest? I don’t know how you would pressure cook but you could use the slow cooker function on the highest setting. 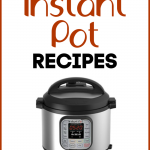 I have instant pot Lux. If I was to use the slow cooker option do I put metal top on it or use clear glass lid? When I use on slow I take out the pressure pin and the sealing ring, this way it don’t get pressure. You really could do either. 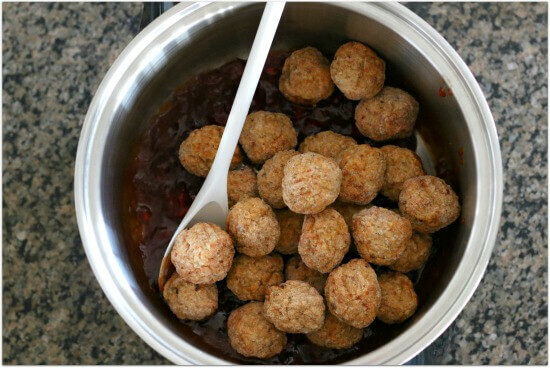 Another easy cocktail meatballs recipe is to use frozen meatballs, your favorite BBQ sauce, and a jar of jellied cranberry sauce. Yeah, I bet rice would be good with it. We just used ours as an appetizer. how would you serve these for dinner? with rice? or would they not really work for dinner? I also saw someone at Smith's Marketplace demo-ing something similar to these. She used the bottle of chili sauce and a can of cranberry sauce. Way yummy. I have also tried the recipe you posted and it's also very yummy. I love your blog!! 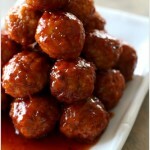 That sounds like a yummy twist on some meatballs I made for a Thanksgiving/football appetizer. For mine, I just bought a bag of Italian-style meatballs from Costco, and layered them in my crockpot with equal parts grape jelly and Pace salsa. It looked really weird, but once it got cooking, smelled amazing and tasted even better.